Dr. Arantza de Areilza, PhD with honors in Social Sciences from IE University, is the Dean of Humanities. Arantza also holds a Master´s degree in International Public Policy from SAIS, Johns Hopkins University (USA), and Bachelor´s degree in International Relations from Institut d'Etudes Politiques (IEP) of the Robert Schuman University (France) and in Political Science and Sociology from the Universidad Complutense (Spain). In her position as Dean, Arantza has been the main architect of introducing the Humanities as a traversal syllabus in all degrees at IE University and all IE graduate schools, a core program studied by ca. 2.500 students yearly. She played a crucial role in the opening of IE University to international students and faculty and to set various educational programs with the University of California at Berkeley and Brown University. Arantza also founded IE Masters in International Relations and several related blogs with the objective of bringing humanities and social sciences closer to the world of business and law. Under her lead the IE University became a member of the Consortium of Humanities Centers and Institutes (CHCI) and the Association of Professional Schools of International Affairs (APSIA). Prior to her appointment as Dean of Humanities, Arantza started her professional life as an international relations research fellow at the Karl- Eberhard Universität Tübingens in Germany in 1994. She worked as international observer for the Organization for Security and Cooperation in Europe (OSCE) in Sarajevo, Bosnia, after the Dayton agreements in 1996. She also served as Executive Director at the Association of European Journalists to promote critical journalism in the European integration process and to defend the freedom of information and freedom of the press in Europe. Arantza also led the information campaign for the 1999 European elections at the European Parliament´s Madrid office. She served as Executive Director of Fundación Consejo España-Estados Unidos, a non-profit organization, created in 1997 as an initiative by the civil society supported by the Administration and cultural institutions, to promote plural dialogue - economic, financial, cultural, educational, political and professional- between the Spanish and US societies. 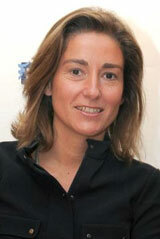 Arantza joined IE Business School in 2001 as Director of International Relations. She has served as the Secretary to the IE Business School Advisory Board and was the previous director of the Liberal Arts Studies Program. She is a patron of the IE Foundation and a member of Saviálogos forum of Banca Cívica. Arantza is fluent in Spanish, French, English, German and Italian. She has an intermediate level of Portuguese and basic notions of Chinese.